'This brooch was designed to illustrate my use of pearls and precious stones with my signature textured gold in a beautiful 'uplifting' burst of brightness. The centre is set with a fine soft white single South Sea pearl. Set into a gold cup with a ridg eof textured gold. This ridge frames the pearl and disguises the joints of the ten radiating wires, as well as giving strength to the pin bar on the reverse. On each precise wire are a series of components which are individually prepared and selected before sliding onto the structure. These are secured by friction and spots of adhesive allowing for dismantling. Five 'Akoya' pearls were selected to compliment the centre and to contrast with the fifteen larger baroque white freshwater pearls. These were carefully placed to sit with good spacing and shape. At the end of each outer pearl I made solid gold beads on wires to sit into the pearl comfortably, giving a good finish and twinkle of light to each end. More light comes from the fifteen brilliant cut diamonds. These are set in three claw mounts - the claws lining up to the spokes - cast from my original hand-made pattern. These are with textured gold with a small 'chenir' on the reverse which slides onto the wire 'spoke'. These are interspersed with plain and textured gold rondells. Finally I carefully lifted each alternate section to give added balance and harmony'. Pearls have been central to jewellery designerJane Sarginson's work, or as she herself expressed it ‘the oyster has been my world’. Her fascination with the variety of shapes, colours and lustres of pearls, and her meticulous approach to design are shown in the subtle juxtapositioning of different types of pearls: in this brooch the central South Sea pearl is surrounded both by baroque white freshwater pearls and by five smaller ‘Akoya’ pearls ‘carefully placed to sit with good spacing and shape’. Jane Sarginson trained in the 1970s at Loughborough College of Art and Design and then at the Royal College of Art. In 1980 she established her own studio in London, focusing on one-off and small edition pieces in precious materials. 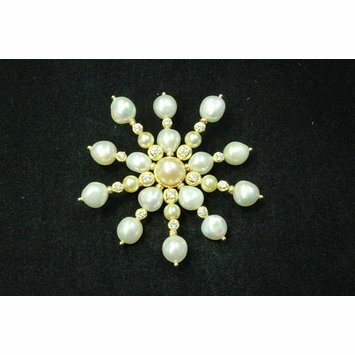 A circular brooch of gold set with 21 pearls and 15 diamonds. Ten pearl and diamond arms radiate from a central pearl. The arms vary subtly in length and composition, as does the angle at which they are set. 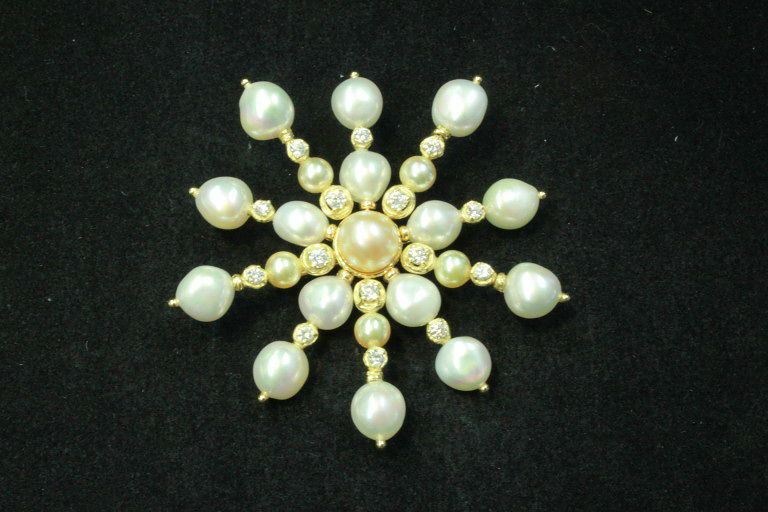 A 'starburst' brooch in gold, pearls and diamonds, designed by Jane Sarginson, London 2013. The brooch is unique but is the fifth in a series of brooches Jane Sarginson has made in this 'starburst' form.